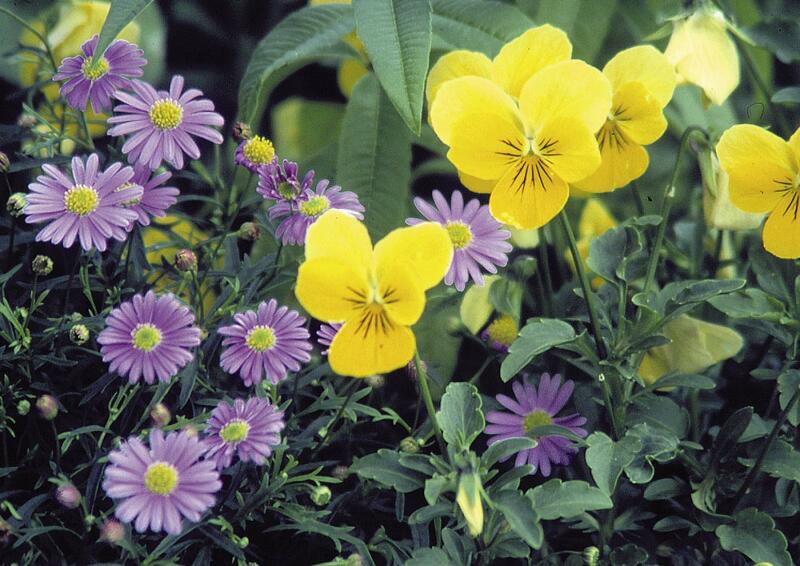 Brachysome segmentosa 'Mauve Delight' with its tiny mauve, daisy-like flowers and lemon-yellow centres, and Viola cortuna 'Princess Yellow', with yellow blooms and delicate maroon whiskers add colour and appeal to scented baskets. Aromatherapy is a relatively new name for an ancient practice. Essential oils, extracted from a wide range of aromatic plants, have been used since the ancient times to restore physical and mental well-being. The ancient Egyptians, Greeks, Romans and Chinese all benefited from the healing powers of essential oils. Today, you cannot purchase cosmetics without reading claims of the 'relaxing' or 'revitalizing' benefits of their product. What makes aromatherapy so popular? Quite simply, it has the power to make us feel good. Whether used for potpourri, scented baths, aroma candles or massage oils, the healing powers of scent are as essential to our well being today as they were in ancient times. Scent often seems a little magical. According to Romy Rawlings in her book Healing Gardens, "Once experienced, scents are rarely, if ever, forgotten and are able to stir deep emotions within us; we can be powerfully affected by the fragrances in our everyday lives." Because our sense of smell is closely related to memory, scents will evoke pictures from our past: our mother's perfume, grandmother's lilacs, or the welcome scent of a favourite dish simmering on the stove. A familiar scent can help to calm and soothe you after a busy day. Gardeners have long enjoyed the benefits of scent while working in their gardens. When planning a garden with a client, I always recommend the addition of scented plants. Perfumed flowers are an obvious choice, but do not overlook the scented foliage of many perennials. Hardy geraniums such as the highly fragrant G. macrorrhizum, or G. cantabrigiense or Lavender (Lavendula spica 'Hidcote', or L. 'Munstead') are all excellent choices. Planted along a pathway, passersby will brush against the foliage of these plants releasing their soothing perfume into the air. The following 'Spa-in-a-Basket' was designed to delight with soothing colours, refreshing scent and surprisingly, sound. For about the same cost as a tiny bottle of designer perfume, these plants will provide fresh, aromatic healing for a full season. Several can be planted in the garden to enjoy for many years to come. Violas are an obvious choice because of their perfumed blooms. African blue basil (above) and hardy Geraniums (below) offer contrast and interest, and their leaves release a soothing scent when touched or brushed by a passerby. Start with a generous willow basket, at least eight inches deep. My basket is an oval shape, 14 inches across and 18 inches long, with a sturdy handle. Line the basket with burlap or landscape fabric and fill with a lightweight potting soil, pre-moistened, but not soggy. The scented theme of the basket is "lemon." All of the materials included are either lemon scented, lemon yellow in colour or their fragrance associates well with lemon. English Lavender (Lavendula angustifolia) 'Munstead' with its fragrant gray-green foliage delights even when it is not in bloom. It is said to relieve stress headaches, insomnia, and encourage skin healing. Plant one 6-inch pot in the centre of the basket. Arrange the following plants around the lavender, as their size and colour dictates. (I used two three-and-a-half-inch pots of each). Lemon Verbena (Aloysia triphylla) is among the most highly scented of the lemon herbs. The plant enjoys semi-tropical conditions and must be brought indoors for the winter months, making it suitable for container growth. It becomes fairly woody in one season, but responds well to hard pruning, filling in quickly with fresh new growth. Misty white flowers appear on young growth. The plant will re-bloom after pruning. The fresh green leaves can be added to hot or cold beverages, desserts or to fish and chicken marinades. Lemon verbena combines well with other tea herbs, and is a fragrant addition to potpourri since the lemon fragrance persists well after drying. Basil (Ocimum basilicum) 'African Blue' has very fragrant, dark green leaves with burgundy ribs and backs. Given an open space and plenty of sunshine, this plant will become a substantial shrub in one season. It can be enjoyed planted in the basket until June, and then planted in the garden. It will look super well into the fall, with its pale pink flowers and dramatic burgundy stems. It is very long lasting when cut and used in flower arrangements. This is one of my all-time favourite plants for both the garden and containers. Basil is the soul mate of tomato dishes. Its fragrance is both invigorating and soothing. (A vase filled with freshly cut stems of basil and set on your desk will refresh you for an entire day). Both the Lemon Verbena and Basil will benefit from frequent snipping, thus providing a steady supply of herbs for cooking, flower arrangements or drying, while encouraging bushy, healthy growth. Lemon-Scented Thyme (Thymus x citriodorus) has tiny, dark green leaves with yellow markings. A gentle stroking will release the delightful lemon scent. Tiny clusters of pink flowers appear in June. It is charming as a ground cover or include it in baskets and strawberry jars. It is indispensable for containers. Excellent when used in marinades for chicken and fish dishes. A sprig of lemon thyme makes a very pretty garnish for a platter. Brachysome segmentosa 'Mauve Delight' has tiny mauve, daisy-like flowers with lemon-yellow centres (add this plant for colour and fun). The tiny flowers close up at night. It attracts butterflies. This delightful plant bloomed well into late October on my deck. Viola cornuta 'Princess Yellow' has cheerful yellow blooms with delicate maroon whiskers. It is delicately scented. I used two cell-packs of four to fill in all of the nooks and crannies around the basket. Their happy faces will peek out from among the larger herbs for weeks on end. The piece-de-resistance is a tiny wind chime, complete with a lemony-yellow ceramic songbird. Hang this from the handle of the basket, or suspend it from a twig over the basket (depending on the height of the plants). It will sing softly when stirred by a gentle summer breeze or whenever the basket is watered. All of the plants in this grouping are fairly drought tolerant, however, they will require more frequent watering once they reach a mature size. Weekly application of a water-soluble fertilizer will promote healthy, vigorous plants. Theresa M. Forte is a garden consultant specializing in perennial borders, based in the Niagara peninsula.